DataOnDemand provides Real Time Pricing, Demand Control and Management, Co-Generation coordination through control of customer-owned generators and provide alarms at specific demand thresholds. The VISION meter Smart Grid System works on 400 and 900 Mhz frequencies through a two-way radio that provides communications to and from the Vision RadioGate. The Vision RadioGate is connected to the network via a TCP server, TCP client or UDP client (Universal Data Point). IP addresses are either Static or Dynamic. The Vision RadioGate can also be connected to a cellular modem via any of the RadioGate’s communications ports. DataOnDemand is best utilized where a significant number of meters are within close range of each other such as college campuses, business and industrial parks and hospital complexes. The VISION meter is programmed to transmit data at one-minute intervals providing an almost instantaneous data stream. The Head End System collects data and determines what to communicate to the customer via the same communications path. Vision Meterings’s VISION meter family offers performance for Commercial and Industrial Advanced Metering Infrastructure applications. 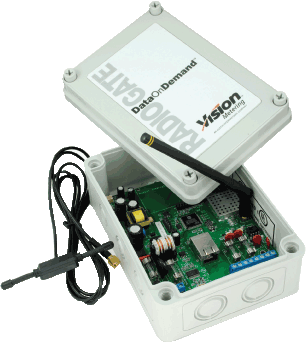 The VISION’s DataOnDemand communication platform utilizes robust 900 MHz radio communication between the VISION Meter and RadioGate to provide real-time data for use with demand sidemanagement systems.